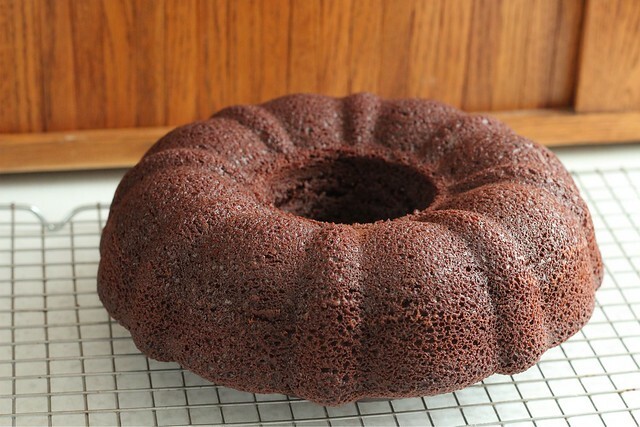 Old is new again: Chocolate Olive Oil Bundt Cake. I don't spend so much time around adults. Because of this, I find that I carry on whole conversations with myself in my head. As I'm washing the dishes I think about recipes, where things originate and who changed them to accommodate what was in hand. I'll waiver my opinion if necessity was the mother of invention, or if times changed and so did palates. I'll wonder just how many times the same chocolate cake was recycled and made new. And then I'll revisit my stacks of old timey recipes and see what I would do differently or if I would even bother making half of them anymore. I might not have a knack for a lot of things, but I have the uncanny ability to remember desserts that were eaten and enjoyed and who ate them and enjoyed them. My special skill allows me to recall then that the last time I made this recipe, a faded photocopy of a Hershey's chocolate bundt cake that my mom wrote upon in her perfect penmanship her mark of highest approval "very good! ", was in 2011 when we had a houseful of my husband's friends over to watch the Pacquaio/Marquez fight. For that occasion I didn't cut the sugar or use olive oil, I made it pretty much as directed and frosted it with melted chocolate chips. And it was eaten completely. But my tastes have changed since 2011, and one thing that I find myself loving even more than less sugar is olive oil and chocolate together. For at least the last year, pretty much every time I see a baked good call for canola or sunflower oil - any "flavorless" oil really -I use olive oil instead. I never worry about the density or richness of olive oil overpowering things... and maybe because I love the flavor of good olive oil so much it never does. I am able to find the once elusive California Olive Ranch oil easily now, and it is my baking staple. This cake lasts well for about 4 days if covered well. I generally store cake at room temperature, and this one develops better flavor on the second day - although the texture is really very nice the day it is baked. You would do well to serve this sans frosting and with a scoop of vanilla ice cream, or just dusted with powdered sugar. I made half of the recommended amount of frosting "glaze", which is glossy when first topped and then dries matte. 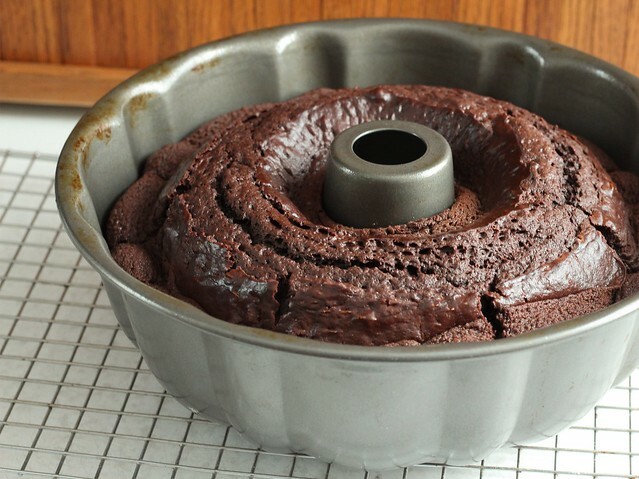 Beating the batter well causes the cake to dome up (as seen in the picture above), but when inverted it isn't noticeable. Heat oven to 350 degrees and butter and flour a 12 cup bundt pan and set aside. Combine flour, sugar, cocoa powder, espresso powder (if using), baking soda, baking powder and salt in a large mixing bowl. Measure olive oil, buttermilk, and vanilla into a smaller bowl, and add all at once to the dry ingredients. Beat on medium-high speed with a hand mixer (or by hand if you like) for a full 3 minutes, making sure the sides are scraped well into the batter. Pour into prepared pan, and bake in the center of the oven for 50-60 minutes or until a tester comes out clean. Cool in the pan on a wire rack for 10 minutes before inverting and allowing to cool completely before frosting. Bring the sugar and water to a just boil in a small saucepan, stirring to be sure the sugar is dissolved completely. Remove from the heat and stir in chocolate chips, stirring well with a spatula to melt them evenly. Immediately spoon (or spatula) the thick glaze onto fully cooled cake. I have no completed cake picture. In part because I didn't feel like setting up a tripod in the fading light just before the daylight savings time change... but also in part because I feel the increasing need to only photograph things when I feel like it. Another thing I think about when washing dishes is if there are any food bloggers that can tell stories without the aid of photography? While the two go hand in hand, sometimes it's more important to just eat the end results and be satisfied with the enjoyment of cake. Especially when they have been few and far between.